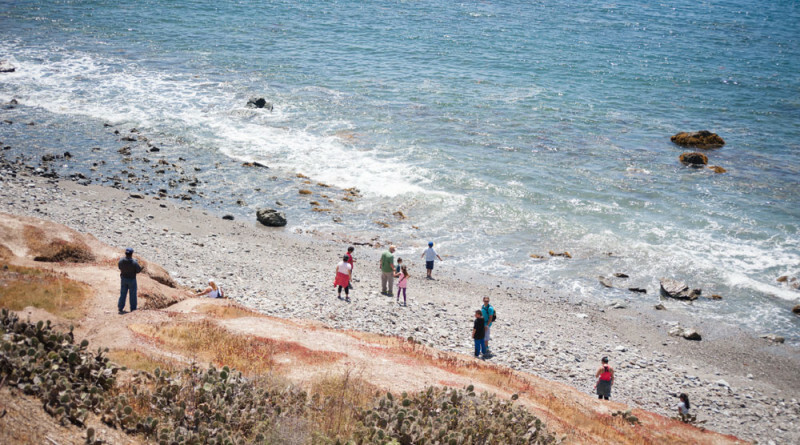 AVALON — Every year, from September through April, the Catalina Island Conservancy’s Education Department offers a once-monthly program free to all Catalina residents, called Families in Nature. The program offers residents an opportunity to explore and experience the wildlands of Catalina. The conservancy takes families to a different destination of Catalina’s interior, giving them an opportunity to see areas that might be hard to access otherwise. This past year’s Families in Nature program featured trips to Little Harbor, Haypress, Bosky Dell, Shark Harbor and Two Harbors. At each venue, a conservancy employee led a nature walk that offered explanations about native plants and animals, as well as a chance to experience more of the island. The past year’s Families in Nature program concluded with an outing to Two Harbors, drawing one of the largest groups of the year. More than 60 children, parents, grandparents and friends came together to enjoy a beautiful day at Buffalo Park. A combination of residents who had attended before joined with first-time participants at the potluck-style barbecue held during each trip, where they shared homemade dishes and enjoyed entertainment provided by conservancy wildlife biologist Tyler Dvorak, who played the guitar. After lunch, almost half the families took a hike to Ballast Point where they enjoyed learning about Catalina’s native plants, as well as some of the history of Catalina “Cat” Harbor. Those who remained at Buffalo Park took full advantage of the playground and explored Isthmus Cove. Martha Flores, who often participates in Families in Nature, said she was grateful to the conservancy’s staff for giving her the opportunity to visit the wild side. The conservancy was able to sponsor Families in Nature during the 2014-2015 season thanks to a grant provided by Los Angeles County Supervisor Don Knabe. The grant provided funding for transportation and supplies. Families in Nature will resume in September. Pre-registration is required. For more information, visit catalinaconservancy.org.